You are here: HomenextPeoplenextFamily MemoriesnextMore Memories of Laindon. It's funny that while reading other peoples's memories of Laindon, little things come into your mind. It’s funny that while reading other peoples’s memories of Laindon, little things come into your mind. One of these memories is of my sister Valerie and myself taking my nan’s accumulator from Corona Road, Langdon Hills, down to a local shop to get it topped up. As my sister was 8 years older than me I could only have been 4 or 5 years old at the time. Another thing I am curious about is that when we lived at Fornham in Sandringham Road, on the left hand side of the bungalow looking at it from the front, and bordering Tylers Avenue, was a quite large plot of land with a derelict wooden shack on it. We used to get into the garden of this place through our hedge and scrump the fruit trees, mum told us afterwards that we did have permission to take some fruit, it took all the glamour away from being caught red handed!! You could see through one of the windows and there were very rickety bunk beds in there, and there was also a well in the garden, which at the time I didn’t realise until my dad warned me where it was. I wonder if anyone knows any more about this property, it had quite grand metal gates at the front, which were very overgrown, but someone must have cared for it at one time. My dad was very proud of his garden, he was a regular in the Army for 14 years, and his vegetables almost saluted!! I think that as both mum and dad were from the East End of London, having a large garden was one of the bonuses of living in the country. He travelled to London every day (to Fenchurch Street) on the old steam trains where he worked in the Savoy Hotel in the print section as a compositor. I also travelled up to Fenchurch Street with him from April 1960 until June 1960 where I actually worked at 108 Fenchuch Street. We moved to Romford in 1960 so I continued to work at the same place but then travelled to Liverpool Street Station (most inconvenient at the time). The bungalow had no sanitation, as many others, and the trek to the outside loo was one of terror in the dark, you always prayed the battery in your torch lasted just long enough. It always smelt of disinfectant and the toilet paper was shiny (San Izal) probably spelt wrong, that was if you run out of cut up newspaper squares. Poor old mum had the job of emptying the bucket, and always tipped a bit on the rhubarb!! However we all survive? When dad built the extension on the bungalow for a new kitchen and bathroom it was great, but when you pulled the plug out of the bath, the water just ran down the path, and on a freezing night the trip to the loo had to be seen to be believed!! The Salvation Army band used to play on the occasional Sunday on the junction of Buckingham Road and Sandringham Road, they stood right in the middle, hardly ever having to move for traffic. They always seemed to turn up as we were listening to Two Way Family Favourites on the radio. Oh happy days!! I also remember a year when we had fog so thick that you honestly couldn’t see your hand in front of your face (I know because I tried) it bought with it a deadly silence. On this particular evening I had invited a school friend Kay Allwood back to my home after school, mum told me to walk home with her to make sure she was safe (what about me!!) I got as far as the bottom of Windsor Hill and told her she would have to find her own way home. That night I laid in bed feeling so guilty, and was quite relived the next morning to see her back at school. I wonder if she remembers that night? I have read mentions of Pound Lane, my Auntie Doris and Uncle Sam Webb lived at number 83, it was set far back off the road, and had a verandah and a stable type door on the kitchen, where my mum took great delight in putting her head through and neighing!! when we went to visit. Auntie Doris together with Eileen Slade (later to become Eileen Webb) although not related to my uncle, were both my godmothers, and while I was a baby and cute, took me all over the place (the novelty dropped off as I grew older, I wonder why!!). Eileen’s sister Sally Slade (now also Webb) used also to work at Baigent’s, so I have been recently told. Another thing I have only recently found out through my sister, was that Dr Long had told her that I was the first baby in Laindon that he had to attend the birth, as there were complications. Home births were very common in those days, I suppose the act of actually getting to Billericay Hospital was a trial at the best of times, without being about to give birth!! Anyway that’s what she was told by him when she was expecting her own first child. When I was very small, I was looked after by Mrs Howell in Tyler Avenue, while my mum was at work. I played with Martin Howell who was a bit younger than me. She used to go somewhere to play whist I think, as I can just remember walking with her, she was pushing Martin in his pram, and I was pushing my dolls pram (purchased at Ling’s). 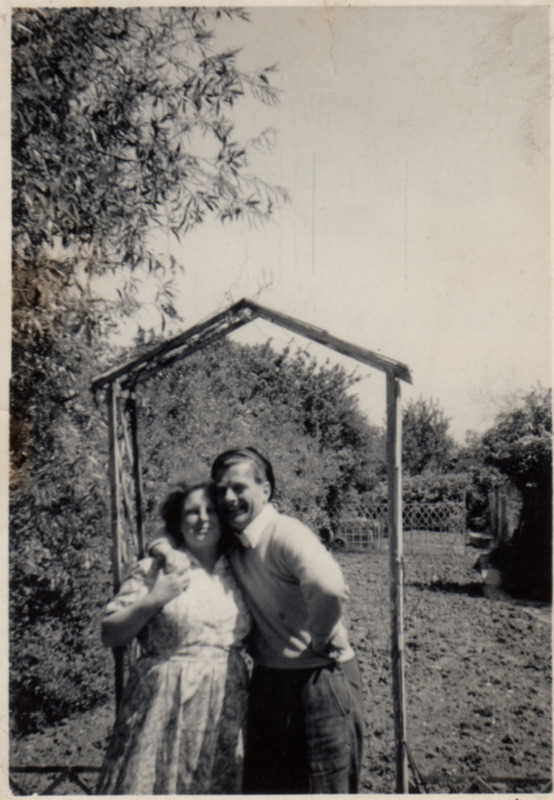 My brother Dave and his wife Doris were married at St Nicholas church in July 1956 on a beautiful sunny day, and have now been married 55 years and still live in Laindon as I mentioned in my other memories. I was their bridesmaid I am very pleased to say, and over the years have been drawing pictures of myself rapidly aging in all their anniversary cards!! I was interested to read that Judith Rothwell’s grandparents lived in Corona Road and were named Drewer. 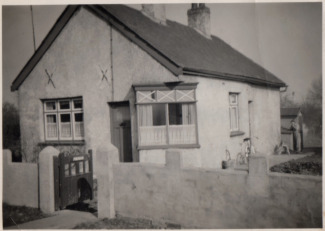 My grandparents lived in the bungalow opposite which was named ‘Aldoral’. Their name was Bridger. My mother was married from Aldoral in 1937. 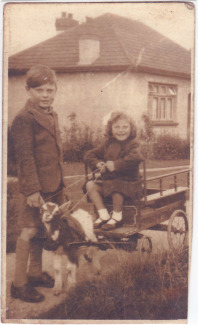 We moved to Devon in 1948 and I believe a daughter of Mr and Mrs Drewer came with a friend to stay for a holiday. Also when one of my grandparents died she looked after me while the funeral was taking place. I also remember my Grandfather taking the accumulator down to the shop to be topped up, and the outside toilet having to be emptied down the bottom of the garden. There were also some people further up the road whose name was Godwin. Did Dave and Doris live in Victoria Road? If so, then they knew my Dad, Charlie Muncey, and I went to senior school with their son Peter. Hello Robert, how lovely to hear from you, I have told Doris and Dave, and Doris has also seen your message on this site. Joan Baterip begins her article with “It’s funny that while reading other people’s memories of Laindon, little things come into your mind.” Too true! One of the contributory comments from Patsy Spendlove nee Roper mentions her older brother Ken having died about 12 years ago. I had not thought about Kenny Roper in donkey’s years. I only knew him by sight in Laindon. I worked in the city and travelled the same steam trains into Fenchurch Street. One day I was taking some documents up the stairs to the second floor and through the mail department, I suddenly did a double take. There was someone new working there. Someone I thought I knew. We both recognised each other at the same time. Lo and behold it was Kenny Roper! I know not where life took him after that few months. A very cheerful chap. I am sorry to read of his death. Hello Joan, I was born in “Corona”, Corona Road in 1947. My mum and dad lived next door to each other before they married in 1946, my grandparents (the Drewers) bungalow I think was called Malva. I also remember Carol Ludlow, I think I bit her once, sorry Carol!! 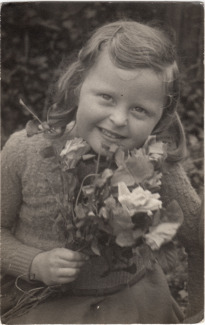 Hi Patsy, My birth was actually registered by Mrs Ludlow in Corona Road, she was a good friend to my nan and my mum. I don’t actually recognise your name, but it’s nice to know that you knew the Ludlow family the name of their bungalow in Corona Road was Lil Fontaine. 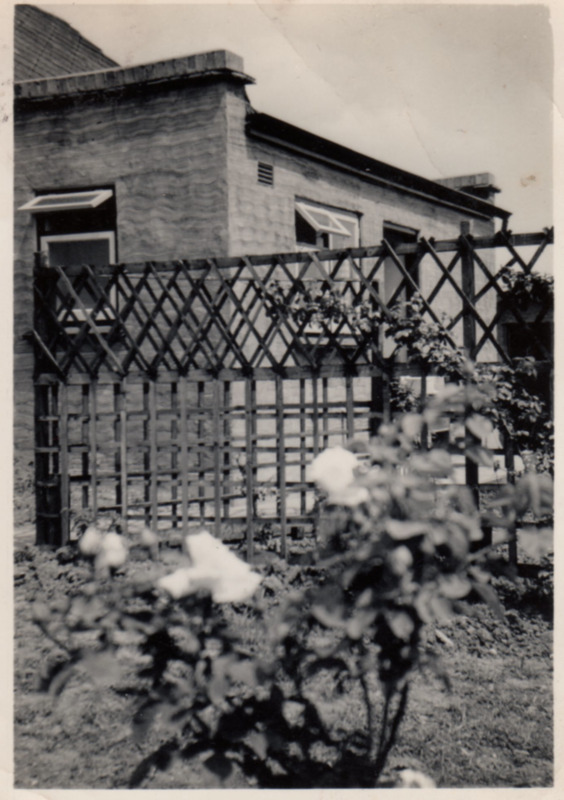 My nan & grandad Ethel & Richard Payne lived at Bank Riggs, Corona Road, what strange names the properties had. I had a friend who lived in Corona Road, her name was Carol Ludlow, she lived there with her mum and dad, if I remember rightly her dad worked in the docks this was about 1955. 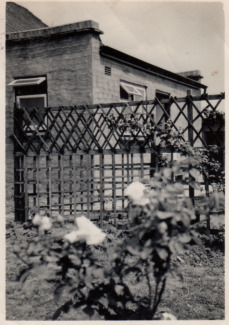 I lived in Langdon Hills next to the church hall in a house called Rose Villa, loved it there, until 1968. The Basildon Corporation bought it and pulled it down what a waste now on the plot is car park shops and a take away I think. When I drive past it’s not the same any more. There were some nice houses and bungalows opposite with 3 judges living opposite us Mr. Jobson, Mr. Seaman and futher along Mr Pavey. I had an older brother Ken, he died about 12 years ago. Thank you for the lovely memories, including the door, you accidentally shut my knee in. I still carry the scar. lol! Nice to see your photo Joan. The family that looked after you were Hale’s and lived at the then 4, Tyler Avenue, while Marlene, Barry & I lived next door at the then number 6. Joan Baterip can be assured that the apparently abandoned plot on the corner of Tyler Avenue and Sandringham Road, Laindon probably remained un-visited, in my experience, throughout most of the 1930s, 40s and 50s until obliterated under compulsory purchase along with “Fornham”. There was nothing particularly unusual about this. All over the area designated as within the Basildon New Town, owners of land could not be traced but this did not stop the developers going ahead with their plans. Whether these “lost” owners or their heirs would still have a claim on the purchase value of the land after all this time I do not know. But if the experience of Stanley Bathurst is anything to go by, it wouldn’t amount to much. In 1937 or 8 he bought a plot of land in Basil Drive about 500 yards from plot mentioned in Joan’s article in order to grow vegetables. He paid £50 for it. In about 1957 it was compulsorily purchased in order to enable a new road, to be named “Laindon Link”, to be driven through from High Road, Laindon to a site to the east that was to become a town centre for the new town. The compulsory purchases made in connection with this exercise were amongst the first in the Laindon area because, until then, most of Basildon’s development had been centred on the Vange area. Stanley Bathurst received, as compensation for the compulsory purchase of his land, just £50 plus £12 as “loss of development rights”! That many people were taken in by the sales talk of the time and purchased building plots in Laindon, which they then forgot about, or only seldom visited is a well-known fact. As an example of this, The afore said Stanley Bathurst, in 1933 wanted to purchase four building plots in Basil Drive immediately adjacent to the two plots already in possession of his father-in-law, Tom Vickery. Stanley wanted to build a substantial brick-built home for his family and the four plots were on offer by the agent, Harry Bebington, at £20 a plot, total £80. When Bebington was approached regarding the sale, another Londoner arrived with a similar offer to purchase at about the same time. Always with an eye to the main chance, Bebington promptly upped the price under the terms of supply and demand and the transaction ended with Stanley Bathurst buying two plots only for £50 and the other purchaser the other two plots for the same price! Thus, Bebington gained £20 more than he had originally expected to make! While Stanley then went to build his bungalow on his two-plot purchase, the other two plots only experienced the construction of a shed and the planting of a dozen fruit trees. The grass was never cut and the plot was only re-visited once a year in the autumn in order that the proceeds of the fruit trees could be gathered and taken away. Throughout the period of WW2 (1939-45) the two plots remained unvisited and the fruit remained unpicked, eventually rotting on the ground. In the 1950s, Stanley Bathurst offered the absentee owner a price for the land which was accepted so, at last, Stanley now owned the four plots he had wanted in the first place. This success was, however, limited. Wanting to build a further bungalow, the New Town Development Corporation which had been granted planning powers that could over-ride those of the local planning authority (in this case those of the Billericay Urban District Council), insisted that two bungalows would need to be built on a site of the size now owned. Lacking the resources for two buildings, only one more was ever built and occupied with the result that when the time came 10 years later the Basildon Development Corporation decided that Basil Drive was insufficiently well developed enough to survive, all properties in the road were demolished and built over. The delightful estate known as “Alcatraz” was the result.